The development of Information and Communication Technologies (ICT) brings about considerable changes in the ways public administration provides information and delivers services to citizens, businesses, and other public administration systems. 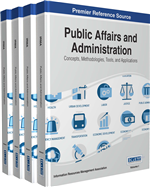 This chapter reviews the application of ICT in the provision of public administration services. e-Government tools have been introduced in various countries in the world and enabled the strengthening of existing public administration services and the activation of innovative ones. m-Government tools, which are related to the emergence and diffusion of Internet mobile technology and devices, allow both overcoming infrastructure deficits and providing innovative services, which are particularly sensitive to users' context conditions. Finally, l-Government tools—i.e., ubiquitous, seamless, user-centric, and automated application of Internet technology to public administration services—have the potential to further redefine the terms of access of users to public administration services and to enhance the ties among citizens, businesses, and the government. The aim of this chapter is to outline and discuss possible future scenarios concerning the use of Information and Communication Technologies (ICT) in public administration. This aim is accomplished by discussing, first, the ways in which e-government allows to enrich the interaction between public administration, citizens and businesses, as well as between different public administrations. Then, we will discuss how the currently emerging ‘m-government’ trend (i.e., ‘mobile government’) may reconfigure the structural and functional features of the interaction with public administration. Lastly, we will outline a possible future scenario in which governments tap the full potential of ICT in conjunction with complementary technological innovations (i.e., artificial intelligence). We call this possible scenario, which is based on the disentanglement of the interaction between citizens and public administration from both the physical space and time, as 'l-government' or 'liquid government.’ In short, liquid government could be one in which citizens interact with an 'augmented public administration,’ namely one which seamlessly combines 'brick and mortar' service delivery with digital ones, provides ubiquitous (i.e., everywhere and anytime) information and service delivery, is centered on the individual user, and makes use of enhanced automation or Artificial Intelligence (AI) technologies. The use of ICT in public administration has significantly increased in the last about twenty years. As highlighted by Islam and Ahmed (2007), the intensification of ICT in public administration has revolutionized the structure, processes, and operations of governmental entities, or at least introduced the potential for doing so. Various authors related this trend to the emergence of a new paradigm for public administration, namely e-governance, which has been adopted or is in the process of being adopted by both industrialized and developing countries alike (Heeks, 2001; Finger & Pécoud, 2003; Chadwick, 2003; Saxena, 2005; Islam & Ahmed, 2007; Marche & McNiven, 2009). Although definitions abound and partially differ, e-governance can be understood as the process through which society is directed to achieve the most desirable long-term goals by means of improved interaction between public administration, citizens, and business through the opportunities offered by state-of-the-art ICT. Within the frame of reference of e-governance, e-government is a tool (Hood, 2006; Solomon, 2002) which broadly consists of the use of ICT for the provision of information and the delivery of public services. The World Bank conceives it particularly suited to “improve the efficiency, effectiveness, transparency, and accountability of government” (World Bank, 2007). The United Nations highlight its potential for transforming the internal and external relationships of public administration (UNDESA, 2003). The Organization for Economic Cooperation and Development (OECD) generally considers it as a tool to achieve better government (OECD, 2003). e-Government can be considered the centerpiece of e-governance, in the sense that the delivery of government service through ICT is an essential requisite for directing the efforts of public administration, citizens, and businesses towards desirable long-term goals. E-governance, hence, generally takes a broader meaning than e-government, in the sense that—apart from the ICT-based instruments by itself—attention is also placed on the mechanisms of ICT-based interaction between public administration, citizens, and businesses, i.e., what enables and stimulates actors to participate in the formulation and implementation of public policies.